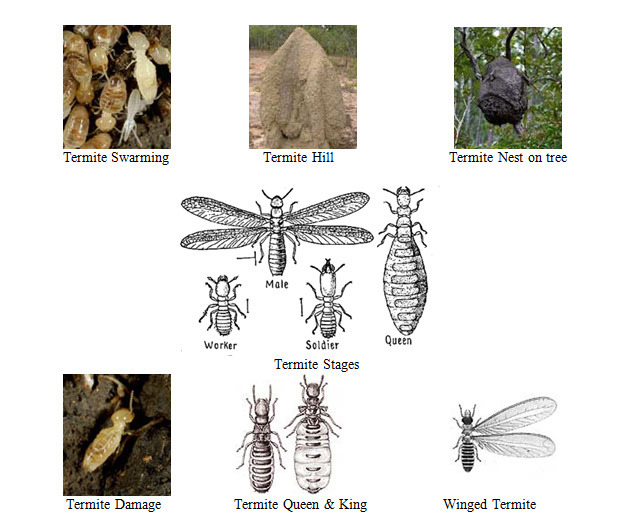 Termites Control Services - United Cell For Pest Control Services Est. Each year over 2 million buildings are invaded by termites, causing millions of dollars in damage annually. It does not matter where you live, your home or business can be a target for termites. Even buildings and houses on concrete slabs are threatened by termites finding their way through small cracks. Professional termite pest control is recommended if you notice termites around the house. Even cold weather offers no protection as termites are found as far as north as Canada and other cold places. Subterranean termites are the most damaging kind and live in colonies in the soil. Each colony is built around a king and queen, the sole purpose of termites is reproduction. Most of the termites that comprise the colony are worker termites, the ones that cause the damage to your home or business. Worker termites search for food sources and share it with others in the colony. They are busy at work 24 hours a day, attacking the structure of a home or business from inside the wood. More often than not, you will not see a sign of their work until something gives way. Immediate pest control action is needed at that point. It is even possible that there are more colonies working on the building at a time. The largest Formosan termite colony found in America had infested a public library in Los Angeles. It weighted 600 pounds and contained 70 million termites. Termites provide a valuable service by breaking down dead wood in forests into soil. They were one of the earth’s first recyclers. 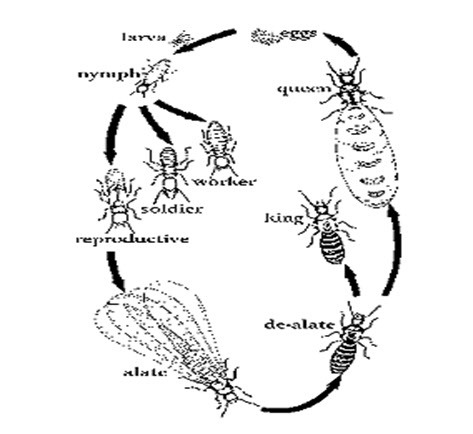 The simplified model of a termite life cycle indicates the three castes, the reproductive, the soldiers and the workers. Due to the fact that termites are hemimetabolous insects, even the nymphs take part in the social life and have their specific tasks to fulfill. The so far poorly understood concept of caste determination does not seem to be definitive or too rigid. Once the caste of an individual is determined, development into other castes is still possible. Soldiers, also referred to as intercastes might turn into workers or even into reproductive, if there is a shortage of individual of other castes. This process is controlled by pheromones. In the case of the queen, there is a specific “queen” pheromone, preventing other individuals from turning into queens. Only if the queen is removed or dies, does the lack of the specific pheromone promote the development of a new queen. De-alates, are alates that cast their wings after the colonizing flight and successively turn into queens and kings. Initially only a few eggs are laid and brought up by a female de-alate. As the number of individuals in the colony grows, the more workers are available to help the young queen to care for the brood. After three to five years the number of individuals is already so large, that the colony of a pest species can turn into the damaging stage. Queen and King, are the main reproductive individuals in a colony. Once there are many workers to help the queen, her only job is to produce a tremendous number of offspring. A large queen may lay more than 1000 eggs per day. The life span of a queen can be as much as 50 years. Neotenics assist the queen in laying eggs, once her productivity decreases. When the queen has died or deteriorated, one of the neotenics takes her place. That is the reason why the removal of a queen from her colony does not necessarily mean the end of the colony. Workers are sterile, wingless and blind males and females. Their cuticle is unpigmented and not hardened; therefore the animals are confined to a dark and moist environment. Workers build the nest and galleries; they fetch food, care for the brood and feed reproductive and soldiers. The worker’s life span is one to two years. Soldiers are, like workers sterile, wingless and blind males and females with an unpigmented, unsclerotized cuticle. Soldiers defend their colony from intruders by the use of powerful jaws and / or by ejecting a white sticky repellent from an opening on their head. Soldiers cannot feed themselves; they have to be fed by workers. Usually the number of soldiers is much smaller than the number of workers. Soldiers can be mandibulate or nasute, depending on the species. Therefore, soldiers can be used for the identification of termite species. The life span of the soldiers is one to two years. Subterranean termites feed exclusively on wood and wood products containing cellulose. Termites have protozoa (microorganisms) in their intestines that provide enzymes to digest cellulose. Although termites are soft-bodied insects, their hard, saw-toothed jaws work like shears and are able to bite off extremely small fragments of wood, a piece at a time. Termites often infest buildings and damage lumber, wood panels, flooring, sheetrock, wallpaper, plastics, paper products and fabric made of plant fibers. The most serious damage is the loss of structural strength. Other costly losses include attacks on flooring, roofs, carpeting, art work, books, clothing, furniture and available papers. Subterranean termites do not attack live trees. It is often difficult to determine the difference between termites and ants. 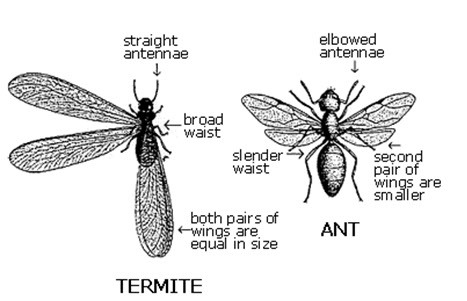 Termites have two pairs of wings (font and back) and are of almost equal length. Ants also have two pairs of wings but the fore wings are much larger than behind wings. Ants generally do not swarm at the same time as termites, but it could happen. Dead termites or wings around windows, doors, cooling/heating vents, or in bath tubs and sinks, are signs of termite activity. There are two types of treatments by which the termiticide can be effectively placed and establish a chemical barrier. Apply termiticide spray mixture on the floor surface prior to pouring of the concrete slab. The soil close to the outside perimeter of the wall should also be treated. High pressure is not recommended as many tiny droplets escape and land on non-target surfaces. Know the floor area to be treated in order to determine the amount of chemicals needed for the treatment. Drill holes in the slab as close as possible to the inside and outside walls of the building, along cracks and expansion joints at 50 centimeters intervals and at around 30cm depth. 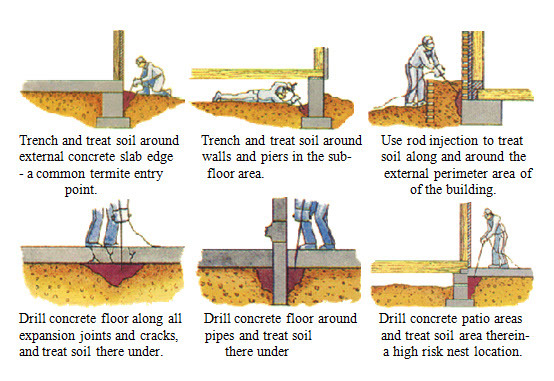 Try to avoid drilling through water and sewer lines and electrical conduits laid under the concrete slab. If possible obtain building plans. Avoid run off; stop injecting when the solution starts to come out through the nearest hole. All holes must be carefully filled and sealed after the treatment has been completed. If it has no concrete slab, rodding may be done along the outside wall at same rate as injecting holes mentioned above. The other method is by trenching around the building, 15 centimeter wide and 30 centimeter depth. Apply 6 liters (spay mixture) per linear meter. Cover the trench once the chemical barriers are placed. Wear Rubber gloves when handling concentrate insecticide. Ensure adequate protection during application of termiticide, such as overall, rubber boots, apron, face shield and respirator with filter/s designed for organic vapors. Avoid contact with the eyes, skin and clothing. In cases where contact has occurred, wash all exposed parts of the body with soap and water. At the time of application, all persons not involved in the process, must be at a safe distance. Do not inject with a leaky hose. Overalls worn for termite treatment should be laundered separately from other clothes.